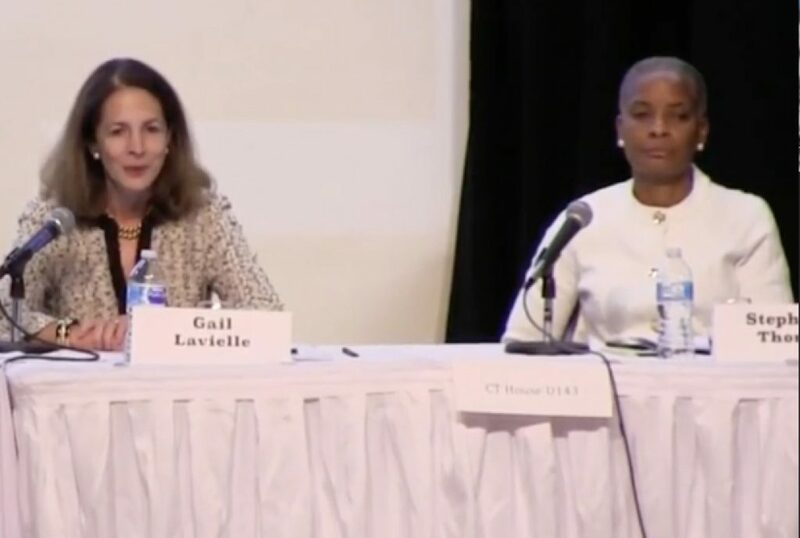 State Rep. Gail Lavielle (R-143), left, and Democratic candidate Stephanie Thomas, shown in a screengrab of Tuesday’s League of Women Voters forum. NORWALK, Conn. – Two District 143 State Representative candidates expressed their views Tuesday in a town hall held in Wilton. “My job is and has always been to represent you, not a party, not a personal agenda, not an ideology. You,” State Rep. Gail Lavielle (R-143) said. Lavielle has represented most of Wilton and parts of Norwalk and Westport since 2010. To learn your State Representative district, click here and enter your address. “It seems like every day I hear something about how horrible Connecticut is and that’s part of the reason I am running, because that belies the feeling that I have, that this is the best place I have ever lived,” Democratic challenger Stephanie Thomas said. The pair were part of a panel that included District 26 State Senate candidates and House District 125 candidates in the forum organized by the Wilton League of Women Voters, with co-sponsors the Wilton Library, the Norwalk League of Women Voters, GOOD Morning Wilton, and student partners from Wilton High School Model Congress. GOOD Morning Wilton estimated that 400 people attended the event in Middlebrook Middle School. You can watch the forum here. Lavielle, a Wilton resident, is Assistant House Minority Leader and Ranking Member of the General Assembly’s Education Committee. She worked for more than 25 years in finance, marketing, and communication, and held executive leadership positions with Fortune 500 corporations. Thomas, a Norwalk resident, is a small business owner with a Masters Degree in Nonprofit Management. She has worked for 30 years as a fundraising consultant advising nonprofit organizations. Moderator Jean Rabinow asked the candidates for their thoughts on phasing out the income tax and/or taxes on personal property, and how the state would balance the budget if that was done. “We can’t do any of this kind of thing overnight,” Lavielle said. She agreed that the state hasn’t been well-managed. “When you are managing an entity this large well, you have to look at reducing taxes, while you look at reducing spending, while you are trying to engineer some economic growth. And you have to do it all at once, at the same time but not in one fell swoop,” she said. She’d prefer to start with the taxes that most pressure retirees, and over time, if the state is being managed well, “then we can look at reducing the income tax,” she said. Lavielle said she’d been a proponent of a “lock box” for transportation funds for years. The lock box would require that transportation-related revenue such as gas taxes and motor-vehicle fees could only be used for transportation-related expenditures. She said she explained to her colleagues that the only type of toll Connecticut can do is congestion pricing. Tolls will take years to install, and the State can expect gas tax revenues to decline because of electric cars and better gas mileage, so, “the smart thing is scenario planning,” she said. A series of projections would estimate how much is needed, and her support for tolls would “only be in the context of the natural disappearance of the gas tax,” she said. “I am in very much in favor of the lockbox but I also agree that it’s not strong enough,” Thomas said, going on to agree with Lavielle that the gas tax revenue will decline. “I believe in tolls,” she said, but residents and poorer people should have special exceptions. People have more time to buy a Mega Millions ticket than they do to vote, Thomas said. She called the 14-hour window for voting insufficient for an important function of citizenship. “Do I have to go to jail?” Lavielle replied. She noted that she voted for at least two amendments for no-excuse absentee ballots. “I think no-excuse absentee is wonderful thing to have and would support that this minute,” Lavielle said. Under current law, qualified voters must provide a valid reason for why they need to vote absentee. “No-excuse” absentee proposals would remove the requirement for voters to state a reason. Connecticut has some of the strongest gun laws in the nation and, “I voted for most of them,” Lavielle said. She expalined that the ones she didn’t vote for were the ones that were proposed before she was elected. A ghost gun bill is needed, she said. Thomas said she’d vote to change the State’s Educational Cost Sharing (ECS) formula, and mentioned that many changes have already been made. The number of Special Education students keeps growing and “we won’t be able to keep pace,” she said. Lavielle said she’d spent much time on education funding and there are “a lot of inequities” in the ECS formula, with Norwalk being hard hit. Teachers are kept out of classrooms because they have an excessive amount of administrative work to do, she said. Lavielle said she “viscerally” supports the state’s water plan, and noted that her support has earned endorsements from conservationist groups. “We are seeing more extreme weather,” Thomas said, mentioning storms, tornadoes and high winds in just the last two weeks. She pointed to 105 million gallons flowing through Norwalk’s sewer system, which was built for 90 million gallons. Towns and Cities need to beef up their plans to deal with climate change, she said. She likes helping people and bringing order to chaos, and is “an effective change agent in my work,” she said. “I want to go to Hartford to get things done so we are not having this conversation two years from now, four years from now, eight years from now, 22 years from now,” she said. On Election Day, if you are not registered and you want to vote, you can use Election Day Registration at city hall. Make sure to bring proper ID and proof of residence at your current address.